Anyone can build a cheap website but how much does it cost to build an effective business website, one that will work for you and grow your business? Our 2017 article on website costs lists different types of websites, associated budgets and illuminates what separates an effective website from an ineffective one. If you are expecting a full business website for under $5,000 that is not something we can build for you and most digital agencies based in the U.S. can’t design and develop an effective website for that budget. (check out our previous article). If You are just starting up and your business is so small that you have to cut corners, we understand, but please be aware that going with a freelancer or offshore company means that quality and communication may suffer. Another option for you is a website builder like Wix or SquareSpace – before you go that route, check out our video on some of the issues with do-it-yourself solutions. One of the best ways to illustrate website costs is by describing the common types of websites, and assigning cost estimates. Written content for the website. Photographs or videos (if required) of your services, business, staff, etc. A logo and basic branding direction (we do branding too). To keep it simple, we are also assuming an hourly blended rate of $100. Different professional agencies will have different rates ranging from $50/hour to $200/hour. List of the types of websites: What do you need? This is a one page website, sometimes called a “landing page” because people will land on this single page when they click a specific link from an ad or email, etc. Although these single page websites can be very long scrolling pages, there is usually not very much content. The website has a simple goal, to motivate the visitor to purchase a product or sign up for an offer, fill out a form, call a number, or download a file. All the content on the site is aimed at having the visitor complete this one task. Because these websites are so focused, it usually minimizes the amount of effort required to build them. Costs for this type of website can range from $3,000 – $5,000+ depending on the project scope. We have a video on one-page websites here. This website is the most common type of business website. It usually has 6 – 12 pages. The types of content areas you will see on these sites are; Home, About, Team, Mission/Vision, Services, Press, Testimonials, Blog, News, Contact. The website is focused on promoting the brand, marketing the businesses services and providing information. We usually create these using WordPress or Drupal as the framework, and customize the design, and features based on the client needs. Costs for this type of website can range from $7,000 to $15,000+ depending on the project scope. A large management team each with bios. A Resource Center with a lot of downloadable content. Custom dealer or store locators. Complex services requiring many sub-pages of content and downloads. Costs for this type of website can range from $15,000 to $30,000+ depending on the project scope. This represents a simple marketing website with an ecommerce feature for the purchase of products or services. In our experience, it’s easier and cheaper to use a hosted cart like Shopify or a simple WordPress plugin like WooCommerce to enable this type of website. These carts work best when you have standard ecommerce requirements. Costs for this type of website can range from $9,000 – $20,000+ depending on the project scope. Need to customize shipping, accounting, fulfillment, and other back-end functions. A large number of complex products. Custom rules around purchasing, such as wholesale and retail pricing. For this level of ecommerce website, we would probably recommend going with Magento, Drupal Commerce or some similar cart. Costs for this type of website can range from $40,000 – $100,000+ depending on the project scope. But how can I make my website more effective? Remember that your website doesn’t exist in a vacuum. It is part of a broad ecosystem because you want to reach your customers wherever they are, the website is an important piece, but it’s only a piece of your online strategy. This means that social media channels like Facebook, LinkedIn, YouTube, Instagram, etc., are all potential extensions for your brand message and in fact may get more traffic than your website and generate more business. So a website can be the hub of your online presence but don’t underestimate the effectiveness of complimentary online channels to boost your brand. Without a holistic, online strategy you are not maximizing the presence of your brand online. Another critical factor for your success is going to be your outbound marketing strategy. This means the strategic use of email and pay-per-click ads. This proactive approach will keep your brand and business in front of your customers. How do I know my website is effective? Applications such as Google Analytics, allow business owners and marketers to see the effectiveness of digital marketing in real-time. It’s amazing the number of tools that are available to track any aspect of your online footprint. An experienced digital marketing agency should be able to tell you exactly how effective a campaign is, what the cost was, and the return on your campaign spend. So there are no more excuses, your pages, ads and emails can all be tracked and analyzed for effectiveness. Through experimentation with various strategies, you will be able to identify the marketing solutions that provide the highest ROI for your business. To see how we’ve simplified complex analytics for business owners, watch this short video. Website budgets vary based on how complex and extensive the website scope is. We’ve provided examples of various types of websites and associated costs. A website alone won’t cut it. Find a digital agency that understands how to make your business effective across the online landscape, by utilizing strategic online marketing channels to broaden your brand. 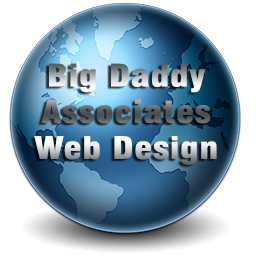 If you are looking for a full-service digital agency that can accomplish all of the above, contact Big Daddy Web Designs.